I joined Mondo Challenge Foundation as Programmes Manager in July 2015. I have worked in development for many years starting as VSO in a remote teacher training college in Vietnam, and working for six years with Concern Worldwide in Mozambique and Uganda. My background is in education, particularly schooling for girls, but I have worked on aid projects of all kinds – for example, last time I was in Tanzania, 24 years ago, it was as a volunteer snorkeler helping set up a marine reserve! I was very happy to revisit the country after such a long time. When I arrived in Tanzania I was surprised by the cold. It is mid-winter in Arusha and you can feel the icy winds blowing from the snowy peaks of Mt Kilimanjaro and Mt Meru overlooking the town. However, the welcome I received was warm and made up for my lack of a coat. I spent a week visiting the women who have benefitted from Mondo’s grants and loans programme as well as spending time in Longido school where Mondo supports a unit for blind children. I was so impressed by the determination of the women with whom Mondo works. Most are HIV+ and have many health problems; all are single, responsible for supporting their children, and in many cases orphaned children from their extended family. From discussions with them, it is clear that the grants and loans programme gives them not only an opportunity to improve their circumstances but also a sense of pride and optimism. As one lady in Boma put it, “I think I would have died without my business. It gave me hope so that I could see a different future”. 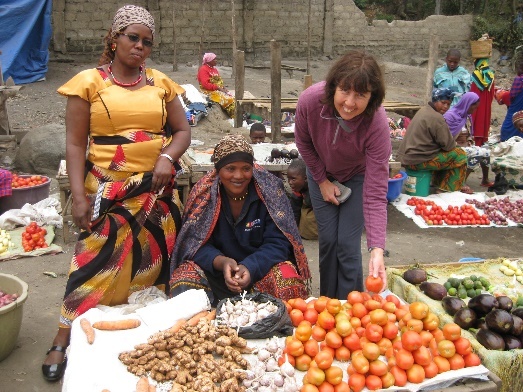 The women I met had invested their grants and loans in a wide variety of different businesses. In the short time I was in Tanzania I visited tailors, cafe owners, market traders, farmers, used clothes sellers and a butcher. I also met Nia, a small lady who runs a brick-making enterprise. She smiled when she told me this: “I know it is normally a man’s trade, she said, but I saw the profits you can make and I thought, I can do that!”. The optimism and hard work of the women has helped them to make significant improvements in their lives. Nia, for example, has used the profits from her business to build a two-roomed house with electricity and piped water, as well as keeping her four children in school. Many of the women, including Nia, have also grown their businesses sufficiently to employ other women, thus spreading the benefits. I also spend time discussing the programme with Mondo’s Tanzanian staff. I was moved by their commitment to “their” ladies: the staff all knew the loan recipients really well and were genuinely concerned about their situation and determined that each one should succeed. It showed me that programme is not just about money, but succeeds because of the personal interest, ideas and support that the staff give the loan recipients. This personal relationship encourages the women to work hard, to make viable businesses and to pay back their loans. Because each of the ladies is known personally to the staff, Mondo can also be flexible, giving loan terms that suit particular businesses, and allowing them respite in case of serious illness or other problems. I enjoyed my visit to Tanzania. I’d like to thank all the women who took time to welcome me into their homes and to explain their businesses (and allow me to taste their produce!) I can see that the programme has very firm foundations, a tried and tested methodology and committed staff. I hope we can grow it to reach more women in the future.